It was the end of January and I was counting down the days, 20 at the time, when I would get on a plane to go on a 24 hour trip with a few layovers to get to Bangkok, Thailand to begin my travels in Southeast Asia for my 2015 Mid-Semester Module (MSM) with my fellow Goizueta classmates. But there was so much left to do for the MSM Shirts! Last year I had the privilege to go to India and during our trip we visited the Bandhwari Village in Gurgaon, right outside of Delhi. Here, young university girls held an afterschool teaching program to help tutor young students to ensure they would stay motivated and graduate from high school. These girls really were impressive as they would go back to the village 3 times a week and at times took 3 buses which could take them 2-3 hours to teach a 1 or 2 hour session. I decided right then and there that I wanted to help and not have my experience in India to be in vain without paying it forward. When I got back from India I decided to promote a fundraiser for the village and created shirts to commemorate our trip. So the “Keep Calm and Curry On” shirts were born! I was able to sell 41 shirts and made a profit of $225 to give back to the organization. Even though it was not much I knew it was a start. As a result of this, I was selected as one of the Tearte Consortium Fellow Global Study Grants to attend the 2015 Southeast Asia Module. This year I wanted to take the fundraising effort to the next level and really make a difference by getting the whole school involved and pay it forward. There were five modules taking place, one to South Africa, one to Australia and New Zealand, one to Japan and Hong Kong, the Southeast Asia trip and finally the Nicaragua and El Salvador trip. I thought it would be a great idea to create and sell one shirt for all of the modules: the Goizueta Globetrotters 2015 MSM shirts. I thought it would be nice to create a 360 fundraising approach where all the funds raised would go back to the Nicaragua efforts. The Nicaragua trip partners with The Nicaragua Community Health Connection, which provides access to clinical services, and preventative and educational health initiatives to rural villages. Thanks to my classmates and volunteers I was able to have the shirts ready before everyone left for their trips and was able to sell 120 shirts raising $1,279.25! This was a great feeling going into the trip as we would all be able to take a piece of Goizueta to the respective countries we were visiting. Now that we had our shirts I began my 3 week journey to Chiang Mai in northern Thailand with a few classmates where once we landed we began walking through the bustling street markets where we appreciated the vibrancy and colors of the different types of fruits, vegetables, meats, and textiles. The next day we were able to really learn about the Thai gastronomy by immersing ourselves in a four hour cooking class at Asia Scenic Thai Cooking School led by the charismatic and very funny Indy, a young university student with a passion for cooking. Our class began by taking a quick field trip to a local market where we learned how to select spices, herbs, fruits, and ingredients that were going into our dishes. We created 4 dishes and now I can say I know how to make authentic pad thai and homemade green curry! We were also able to visit an Elephant reservoir, Elephant Nature Park, where we were able to ride elephants and play with them in the river, as well as visit Tiger Kingdom and interact with some of these majestic creatures as well. After a few days we joined the rest of my Goizueta classmates in Bangkok where we began our module with a visit to The Coca-Cola Company. Of course or session began with a refreshing Coca-Cola beverage, but what was really impressive was to learn about some of the initiatives the firm was promoting, such as empowering women in rural areas by teaching them skill sets, such as sewing, basic accounting, in order to become entrepreneurs and run their own retail business ventures. We then sat with a director for the Thailand Chamber of Commerce where we learned the intricacies of starting and running an international business in a foreign country. We were also able to visit some of the cultural sites such as the majestic temple- Wat Pra Kaew with golden pagodas that houses the Emerald Buddha. We also were able to visit the Reclining Buddha that measures an impressive 46 meters and is covered in gold leaf! I was really excited about the next part of the trip when we went to Bagan, Myanmar. Myanmar has only been open to tourists since 2008 so it really felt authentic and the people were very welcoming and very friendly. That same evening we were able to watch the sunset over the plains overlooking the magical 2000+ pagodas that it is known for. This was not enough for us as we all got up early the next day and rented electric bikes and rode a few miles in the dark to make it before sunrise to appreciate the beauty of a new day over the pagodas. This was one of the most magical experiences I have ever encountered and I urge everyone who has a chance to visit Bagan to experience it. We also had a chance to attend a novice initiation ceremony for children preparing to become monks at a rural village, which was an honor as it was a very intimate celebration for the village. We then left to Nyaungshwe to visit Inle Lake, famous for its fishermen leg rowers, where we were able to see its floating markets that it is known for. There we spent some time visiting lacquerware, metallurgy, and women’s lotus and silk weaving center where I was able to get a special memento from one of the woman weavers who tied pieces of silk on my wrist and I wore as a bracelet for the remaining of the trip. After a couple days at the lake we went to the capital Yangon where we visited an orphanage. We we were able to talk to a few of the girls and their experience at the house and learn how a couple of them were attending university to become doctors, which was really impressive. That evening we were able to visit the glittering Shwedagon Pagoda (since it has over 4,500 diamonds) during sunset where we offered a Lotus to the Buddha. It really was a magical experience and I felt like a local. On our last leg of the trip we visited Siem Reap in Cambodia and the jungle adventure began. We went to Ta Prohm (the Tomb Raider Temple) where I felt like I was lost in time, with trees growing out of the ruins. We then had an opportunity to eat a delicious Cambodian French lunch at an NGO, Ecole Paul Dubrule, where we spoke to the ambitious student chefs who were studying to graduate to find jobs in the culinary and hospitality industry. Last, but not least, our afternoon visit ended with the awe-inspiring Ankor Wat, where centuries ago the center of the temple was thought to represent the center of the universe for the Hindu god Vishnu. This site was breathtaking and very unforgettable; as I was heading out a local monkey stole a banana out of my hand. On our final day we decided to go on a bike tour and visit the vast rice paddies and see the water buffalo up close. The highlight was going into a wat where we were blessed by monks, a very majestic experience. Since the MSM was now over some of use decided to extend our trip for a few days to visit the Thailand beaches to relax under the sun, go snorkeling, and allow me to really reflect on this amazing experience. Yet, I did not have too much time to relax as I had a much unexpected surprise from my fiancée, who also was completing the MBA at Emory and traveling with me during the module, when he proposed during a sunset dinner in Krabi Thailand. Of course I said yes! So now I have another reason for this trip to always be memorable. When I came back to Goizueta I carried Southeast Asia in my heart and I knew that my experiences on this trip will never be forgotten. I was able to really appreciate the intricacies of what goes into a homemade Thai dish, I have a greater appreciation Buddhism, and the friendliness and generosity of Southeast Asians reminds me to continue to smile at life and be more generous towards others. What has even made the trip even more memorable was that at the end of April I was able to personally hand Nerys, one of the Nicaragua Community Health Connection community leaders, a check for the money raised from the MSM shirts. 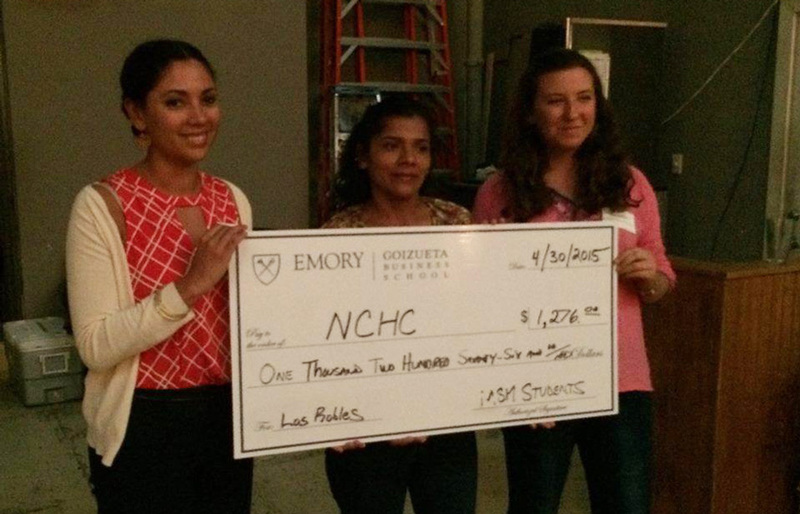 The Emory Goizueta Social Enterprise made this possible by having her visit Atlanta to talk to others about the center and her endeavors. It was a nice way of finishing my MBA and pay it forward to her, much like the Tearte Family Foundation paid it forward to me by allowing me to take this unforgettable trip. Thank you Mr. and Mrs. Tearte, thank you for taking this journey with me.